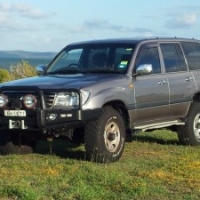 I would like to thank you for the excellent service you provided to us on our recent 5 day rental of a 4WD vehicle from your firm and would recommend your service to any prospective client. The Pajero you provided was very comfortable and we experienced no problems driving it over all terrain on Fraser Island. Our stay in your B & B was most enjoyable, the tariff very reasonable and the full breakfast delicious. Our only downside was the weather, but of course one has no control over that. We do look forward to returning one day to see this spectacular destination in better conditions. Once again thank you for the efficient and professional manner you conduct your business and good luck for the future. 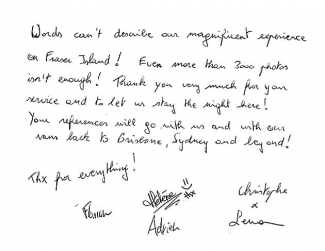 We wanted to thank your great efficiency in organising our long weekend on Fraser island. Everything went very smoothly with the Landcruiser and your briefing on how to drive a 4WD was very useful. 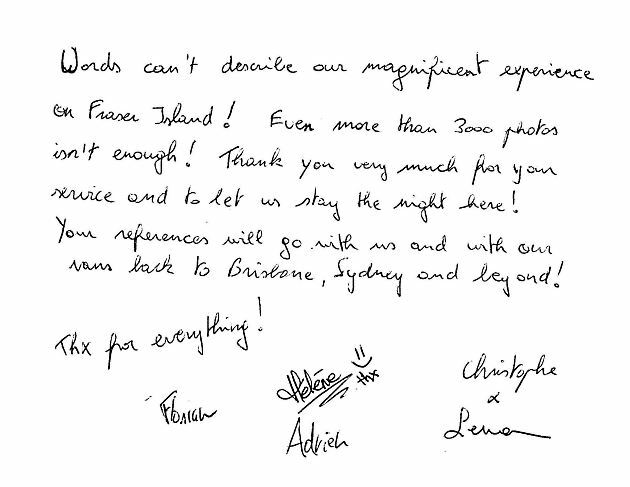 We also appreciated that you took the time to give us some advice on what not to miss on the island. We will definitely recommend Atlas 4WD Hire to future visitors. 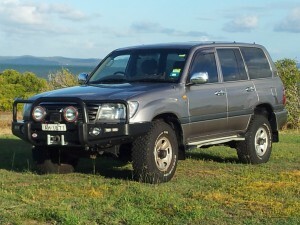 It was a great experience renting from Atlas 4WD Hire. I left a comment on their website to ask for availability of vehicle for the following week, which was actually the busy Easter weekend. Cristina was extremely responsive and replied within 24 hours. She even helped to book the barge and accommodation on the island for us. On the day we arrived, we had a briefing in the evening. Anthony went through all the do’s and don’ts with us and the insurance details. It was Good Friday and my friend and I were worried about not having food in town. Anthony helped to call the restaurants and went online to check if they are open which I really appreciated. The next morning Cristina cooked us a hearty breakfast which we chose the previous night before we headed to the pier to board the barge. After breakfast, Anthony drove us to the pier to pick up our barge ticket. After dropping us off, Anthony rode to Fraser Island on his jetski to get our vehicle ready (it was parked on the island). 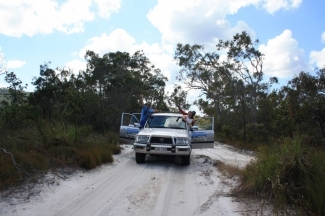 When we go to Fraser Island, Anthony was already waiting for us with the vehicle at the pier. After showing me the features of the vehicle, Anthony let me drove on the dirt road for a little bit to get use to the 4WD driving as I’ve mentioned to them that it was my first time. On the day we left the island, I filled up the tank and park the car in a parking lot near the pier. We took the barge back to Hervey Bay and Cristina picked us up at the pier. Overall it was a great experience renting from Cristina and Anthony. Everything went well and the vehicle works well too! 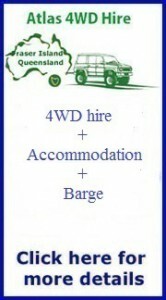 I would definitely recommend renting from them!